CITY HALL — The average Chicago homeowner will pay $177 more next year in property taxes to fund the Chicago Public Schools next year, as officials promise the district is now on firmer financial footing after years of massive deficits and repeated rounds of cuts. However, members of the Chicago Teachers Union and several community groups rallied Thursday at City Hall to tell members of the City Council's Finance Committee that despite the looming tax hike, schools are still underfunded — and few have librarians or enough counselors to help students. The tax hike is set to be approved Oct. 25 by the Chicago Board of Education, whose members are appointed by Mayor Rahm Emanuel. More than half of the tax hike will go toward Chicago's teachers' pensions, which have long been underfunded by state and city officials. Emanuel Wednesday defended the tax hike, which he has previously said was needed to "avert a train wreck." 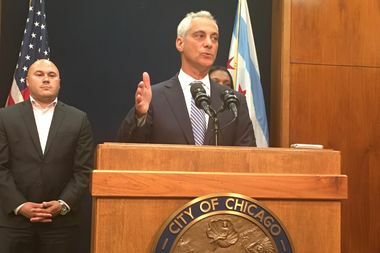 "I don't take lightly asking taxpayers for anything," Emanuel said. "This is for education, not willy-nilly." Chicago students and parents will not have to worry about mid-year budget cuts, which disrupted the last two school years, Emanuel said. That gave principals a "palpable" sense of relief, Emanuel said. The largest portion of the $225 million tax hike — $130 million — will come from a 2.5 percent property tax approved by state lawmakers as part of a new school-funding formula, district officials said. Because that increase is tied to inflation, the board can generate another $16 million, officials said. That works out to about $177 per year for the owner of a home worth $250,000, officials said. That new funding formula requires CPS officials to give the district's charter schools an additional $37 million to ensure all students are treated equally. The district plans to save $55 million by refinancing its debt at a lower interest rate, officials said. The district will add another $67 million to its bottom line by raising its existing property tax rate to keep pace with the cost of living, officials said. A separate property tax levy earmarked to build new facilities and expand overcrowded schools will increase by $3.6 million, also to keep pace with inflation, officials said. The CPS budget also relies on $80 million from the city to cover the cost of securing schools. Ald. George Cardenas (12th) — along with a half-dozen community groups including the Brighton Park Neighborhood Council, Logan Square Neighborhood Association and Parents 4 Teachers — called Thursday for the City Council to dip into redevelopment funds and tax big firms to fund schools. If the city is prepared to offer Amazon a flush incentive package to pick Chicago for their second headquarters, officials can fully fund schools, several speakers said. “If the city is willing to offer hundreds of millions of dollars of tax cuts and land give-aways to lure Amazon, then there’s money to fund our schools," said Catherine Henchek, whose son attends Vaughn Occupational High School in Portage Park. Cardenas said half of any surplus in the city's tax increment financing funds should go to Chicago schools. Last year, Emanuel avoided a teachers strike by using approximately $88 million from TIF funds. The coalition also renewed their call to tax firms with more than 50 employees $33 per worker per month. However, Emanuel frequently touts the elimination of the $4-per-employee monthly tax by the City Council in 2011 at his request as a key reform that helped spur millions of dollars of economic activity in the city and prompted dozens of companies to relocate to Chicago. CITY HALL — City officials will not have to raise taxes to cover thelooming budget gap of $114.2 million — or to bridge the remaining shortfall facing the Chicago Public Schools, city officials said Tuesday. That means the only new tax hike facing most Chicago homeowners in the next year will be the 2.5 percentschool property tax hike Emanuel has said is necessary to "avert a train wreck." The spending plan released Aug. 11 by CPS officials relied on $269 million from the city that has yet to be approved by the City Council. However, because the new school-funding formula includes about $450 million more for Chicago schools than last year — including the authority to to generate $125 million by hiking property taxes about 2.5 percent for the average homeowner — the gap is roughly half as big as initially expected, said Adam Collins, a spokesman for Emanuel. "With historic school funding reform now the law in Illinois, and with the state of Illinois now covering some of the costs of Chicago teacher pensions for the first time ever, CPS' financial outlook has improved dramatically," Collins said. The city's 2018-19 spending plan — set to be released next month — will include between $70 million and $80 million to cover the cost for Chicago Police officers to patrol the schools, Collins said. That won't trigger the need for another tax hike on top of the one expected to be approved by the Chicago Board of Education, Collins said. "We believe we can balance the city's budget without a citywide tax increase," Collins said. However, Emanuel is still expected to ask aldermen to hike taxes on cell phones and land lines by 28 percent. That will keep the laborers' pension fund out of the red, officials said. The remaining CPS budget gap — estimated between $40 million and $50 million — will be covered through "savings from interest and through refinancing debt," Collins said, as well as "administrative efficiencies such as procurement rebates and additional Medicaid revenue." When the city's annual budget forecast was released in July, Emanuel declined to say whether more tax hikes were looming to bridge the projected gap — or to cover the second installment coming due on the mayor's promise to expand the Chicago Police Department by 970 positions. City officials have announced plans to hire 266 police officers, 100 detectives and 75 sergeants in 2018, which is expected to cost approximately $60 million. In addition, it is not clear how much the city will have to pay to reform the Police Department — under the authority of a federal judge — in the wake of the fatal shooting of Laquan McDonald. Labor agreements with 90 percent of the city's 30,0000-member workforce expired June 30, meaning personnel costs could also rise more than anticipated by the annual budget forecast. The city's financial condition is also expected to benefit from a new authority to refinance up to $2.5 billion in debt under a new state law that could save taxpayers as much as $75 million a year, officials said. That method of debt management is already used in New York City, Philadelphia and Washington, and could raise the city's credit rating, officials said. That refinancing is expected to be introduced to the City Council Wednesday, and could be approved in October. CHICAGO — For Chicagoans, the start of 2017 means everything from turning on the tap to going to the grocery store will be more expensive. A host of new laws — some imposing new taxes and fees — will take effect once 2016 comes to an end. Unless you have your own bags, a trip to the grocery store will put the squeeze on your wallet in 2017. All Chicago retailers — from the biggest big box to the tiniest mom and pop store — can start charging shoppers 7 cents for every bag they need to haul away their weekly rations of bacon and eggs. Shoppers will be able to see the charge on their receipts, right next to the charge levied on other products in the city, like the bottled water tax. The plastic bag fee is expected add $9.2 million to the city's coffers and push Chicagoans to bring reusable bags and avoid sending the bags to landfills — or the city's recycling centers. A ban on single-use, thin plastic bags approved by the City Council in 2014 was considered a failure and prompted the new law. The city will get a nickel from the sale of each bag, with the store owner getting the other 2 cents. The Council agreed in September to hike the city's water and sewer taxes by 30 percent, adding to the long list of fees and taxes that have risen as officials struggle to put the city's pension funds on firmer ground. The average household will pay an extra $4.50 a month next year in order to turn on its taps and flush its toilets. When the tax is fully implemented in five years, the owner of the average home will pay $228 more a year. Last year, the Council approved the largest property tax hike in Chicago's history — $589 million phased in over four years. That means property owners across Chicago will see their city taxes rise by $109 million in 2017 to pay for pensions for the city's police officers and firefighters. The Chicago Public Schools also approved a property tax hike for 2017 bills in an effort to bring in an additional $245 million, with most of that money earmarked for teachers' pensions. The bottom line for the owner of $250,000 home is a property tax bill that is about $350 higher in 2017 than in 2016 — on top of the higher taxes for water and sewer service. Starting Sunday, stores near elementary and middle schools that sell cigarettes can start selling flavored and menthol tobacco products again. Earlier this month, the Council lifted the ban imposed in October 2014 after owners of convenience stores and gas stations complained the ban on the popular smokes has forced them to lay off workers and slashed their profit margins. Fourteen aldermen voted against the plan, saying it would make it easier for children to start smoking and become addicted. The city still bans the sale of the flavored and menthol tobacco products within 500 feet of high schools. Stores within 500 feet of a high school can no longer add tobacco products to the items they offer for sale, under the revised ordinance. In June, the Council imposed new regulations on homeowners who use home-sharing platforms like Airbnb that would levy an extra tax on home-sharing hosts, limit on the number of units in buildings that can be rented out and require hosts to keep records on guests. But a federal lawsuit filed by opponents of the regulations has put those rules on hold, even though Airbnb representatives called the new law a "big win." Most of the ordinance is set to take effect on Feb. 28, after the next hearing in the lawsuit, which is set for Feb. 1. Drivers who rely on free street parking spots likely will have to feed a meter in 2017. The firm that leases Chicago's parking meters got the green light to install 752 parking meters — 153 in the Loop — with the rest spread throughout the city. Drivers will also pay $2 more to park at a meter near Wrigley Field starting two hours before Chicago Cubs games and other special events at the Friendly Confines and one hour afterward. ayor Rahm Emanuel's administration projects a $114.2 million budget shortfall for 2018, but a mayor who's already raised a slew of taxes and fees was mum Monday on whether he'll ask taxpayers to cover the difference. While City Hall was trumpeting the lowest shortfall since 2007, Emanuel aides acknowledged their bottom-line figure left out a bunch of costs the mayor has committed to for next year. Chief among them is $70 million to hire new police officers, and there's also tens of millions more dollars in potential additional costs for police reform efforts and back pay for city workers if new contracts that expired at the end of June are approved. With those added in, the mayor and City Council may have to find ways to close a gap that's more in the neighborhood of $200 million. How that will be done remains to be seen, with Emanuel financial spokeswoman Molly Poppe giving an answer that's a mantra at this point in the city budget process each year: "We're looking at everything, but our focus is on savings, reforms and efficiencies." Poppe said additional new costs were not added on because the city deemed them "not structural" — even though costs for new officers will reoccur in future years and increase over time. Using the city's financial logic, Emanuel on Monday cited the "smallest structural deficit in a decade," crediting that to cost-reduction efforts he'd made over the years. But the mayor also has increased taxes and fees for city operations since first being elected in 2011, when the shortfall was $636 million. Emanuel did not respond Monday when asked whether he would consider another tax increase to fill next year's budget hole — one that could grow even further considering his pledge to open Chicago Public Schools on time and keep them open despite continued uncertainty over state funding for the cash-strapped school district that the city has contemplated helping out. Instead, Emanuel pivoted to familiar talking points about steps he has taken to stabilize the city's finances and how state inaction is to blame for forcing him to borrow hundreds of millions of dollars for school operating funds at high interest rates documented in a Monday Chicago Tribune story. "I would prefer nothing better than not to have to pay high interest rates, but that's for the state that's more than 9 months to a year behind in paying its bills, which is the turnaround that Gov. (Bruce) Rauner said he was going to take care of," Emanuel said. If he chooses to include a tax increase when he proposes his budget later this year, Emanuel is likely to face some public pushback, given recent tax hikes by City Hall, Cook County and state government that will drain hundreds of dollars from the pocketbooks of Chicagoans. But it also may be the mayor's last chance to increase taxes before 2019 — an election year for city officials, who are loathe to ask taxpayers for more money just before voters go to the polls. The mayor's failure to include future yearly costs in the city's budget shortfall was reminiscent of last year, when he did not factor in the money he knew would be needed to contribute hundreds of millions of additional dollars to pension funds for city municipal workers and laborers. Emanuel ended up pushing a new tax on water and sewer service through the City Council last year. That's expected to raise $239 million a year by 2020 to boost contributions to the municipal workers' pension fund. A year earlier, the council approved a record $543 million tax hike that won't be fully phased in until 2019 to boost contributions to pension funds for police officers and firefighters. And in 2014, aldermen approved a $1.40 a month increase in the city's 911 fee on land-based and cellular phones that was expected to raise about $40 million a year for the city laborers' fund. That 911 fee revenue has come in lower than expected and could diminish further in future years as more people abandon their landlines and rely solely on cellphones. However, the General Assembly this year cast aside Rauner's objections and gave City Hall authority to increase 911 phone fees by another $1.10 a month. City officials have said the extra money — about $27 million a year — could be used to help update the city's 911 system, which could free up money to be used elsewhere. Other potential options to bring in more money in 2018 include further expansion of surge parking meter pricing around major arenas on event days, as the city did this year near Wrigley Field to raise about $1.5 million. The city had discussed surge pricing around Soldier Field but has yet to put that in place. The city also could expand a trial program of charging commercial vehicles to use loading zones that was expected to bring in between $13 million and $18 million this year after it was launched downtown and in two nearby wards. Poppe said the two programs are still being rolled out and "there's no plans for expansion at this point." Whatever Emanuel and aldermen do, taxpayers will continue to bear an increasing burden because of previous decisions. Property taxes and the new tax on sewer and water service are both going up next year — with a property tax increase of about $43 for the owner of a $250,000 home and an annual water tax increase of about $37 for a typical homeowner with metered service and $76 for a homeowner without metered service. In addition to the pension-driven tax hikes, Emanuel and the council also have raised taxes to close gaps in the city's day-to-day operating budgets and rebuild the city's aging water pipe system. With Chicago Public Schools property tax hikes added in, the increased tab for the typical homeowner under Emanuel — who first took office in 2011 — will be about $1,700 a year once all the taxes are fully phased in, according to a Tribune analysis. As debt service costs and pension contributions continue to rise into the next decade, the city will again need a combination of additional revenue and cuts — totaling as much as $1.3 billion, according to an analysis released last week by Kroll Bond Rating Agency. Indeed, the budget forecast projects the budget hole increasing to $330 million by 2020. To date, Emanuel has increased taxes and fees by nearly $1.4 billion, both to start restoring financial health to city worker pension funds and eliminate the use of one-time revenue that became common practice during the later years of former Mayor Richard M. Daley's 22-year tenure. For the second year in a row, the property-tax man is about to dig deeper into Chicagoans wallets. On average, Chicago homeowners can expect a 10 percent increase — about $360 — when the second installment of their property tax bills arrive later this month, according to a new report from Cook County Clerk David Orr’s office. It’s the second straight year of double-digit increases prompted in part by tax hikes approved in 2015 by Mayor Rahm Emanuel and the City Council. Those increases, for pensions and school construction, sparked last year’s bills to increase nearly 13 percent on average. Residential property owners aren’t alone. Commercial property taxes in Chicago will rise by 9.3 percent on average this year — more than $1,100. Last year, that increase was about 10 percent. Orr’s office said the increases this year have been sparked by the Chicago Board and Education and city government needing more money from taxpayers to pay police, firefighter and teacher pensions. Molly Poppe, a spokeswoman for the city’s Office of Budget and Management, said the city property-tax increase amounted to “a better choice” than cutting city services to preserve workers’ retirements. The property-tax increases for homeowners in the Cook County suburbs won’t be as stiff. Homeowners in north suburban Cook County will see their property taxes go up 6.5 percent on average, about $432. Their south suburban counterparts will see a 3.9 percent increase, about $192, according to the clerk’s Office. The good news for Chicago homeowners is that the city’s industrial and commercial tax base makes for lower bills than their suburban counterparts with similarly priced homes. The bill for a home with a market value of $200,000 on average will total $3,506 in Chicago, $4,545 in the north suburbs and $6,567 in the south suburbs. Tax bills are due Aug. 1. The change in individual homeowners’ bills may vary widely, depending on how the value of your property is assessed in comparison to other homes. For Chicago residents, the change in tax bills was estimated based on an average single-family residence with a market value of $224,500, Orr’s office wrote. In the north suburbs — where properties were reassessed for the first time since 2015 — the estimated increase was based on an average home worth $299,100. The south suburbs’ model was a home worth $163,000. Property taxes have taken a central role in the early stages of the Illinois governor’s race as lawmakers debate hiking the state’s income-tax rate. Last week, Gov. Bruce Rauner bemoaned property tax rates in Illinois as a prime hindrance to economic growth. Chris Kennedy slams property tax system. He also used it to get a big break. As a candidate for governor, Democrat Chris Kennedy has called for a sweeping overhaul of a property tax system he calls "a racket" that enables politically connected lawyers to arrange lucrative breaks for their clients. But as the part-owner and manager of a four-acre parcel near the Merchandise Mart, Kennedy leveraged the very system he now condemns to shave $1.5 million off property tax bills for the lot, known as Wolf Point, just as he and partners were priming it for a $1 billion high-rise development. An investigation by the Better Government Association found that Cook County Assessor Joseph Berrios had initially calculated a $23.5 million fair market value in 2012 for the then mostly undeveloped Wolf Point property. That was up sharply from the pre-2012 valuation by the assessor's office of $13.5 million. Instead, Kennedy appealed the valuation through the law firm of Thomas Tully, himself a former Cook County Assessor, who since 2012 has donated more than $135,000 to political funds tied to Berrios. The appeal was so successful that Berrios' office didn't just roll back the increase, it slashed the market price valuation down to $6.2 million—less than half what it was prior to 2012.That steep reduction translated into tax bills of $279,333 in 2012 and $283,113 for 2013, each year far below the $546,978 charged for 2011 alone. Had the higher valuation stuck, the Kennedys' Wolf Point combined tax bills for 2012 and 2013 would have totaled more than $2 million. In an interview, Kennedy argued that the lower valuation and taxes were fair because the Wolf Point property, located at the confluence of the Chicago River and its north branch, was at the time being used only as a surface parking lot. "During that period, the taxes paid are consistent with the taxes paid by peers in the parking lot business," Kennedy said. "We were very much in the middle of the pack with our peers." At the time the appeal was filed, however, the Kennedy investment group had already launched an effort to seek city approval for radically transforming Wolf Point into three mixed use residential and commercial high rises, the first of which opened on the site in 2016. Kennedy defended the decision to hire Tully for the appeal as one in keeping with his fiduciary duty to co-owners of the property, most of them siblings and cousins from the extended families of the late President John F. Kennedy and his brothers, the late New York Senator Robert Kennedy and the late Massachusetts Sen. Edward Kennedy. Chris Kennedy, who long has managed the property on behalf of his relatives, is a son of Robert Kennedy. Among his partners in the investment is Caroline Kennedy, the daughter of President Kennedy. A major focus of Chris Kennedy's campaign for governor has been what he sees as the inequities of a property tax system in Cook County driven in part by political donations to Berrios from lawyers who specialize in tax appeals. "I don't believe there's any integrity in the system," Kennedy said in his interview with the BGA. "There's no rule of law." In a separate prepared statement supplied to the watchdog group, Kennedy lambasted the current system as one "that benefits the wealthy who can afford lawyers and leaves those who can't behind. I know firsthand how it works and how to change it." Property tax fairness emerged as a campaign theme for Kennedy after media reports earlier this year about a big tax break obtained by billionaire investor J.B. Pritzker, a key rival of Kennedy's for the Democratic nomination. The Chicago Sun-Times reported that Pritzker saved nearly $230,000 in taxes on a Gold Coast mansion he owned next door to his personal residence by arguing that the second home was "uninhabitable." That prompted Kennedy to contend in a recent speech that the flawed property tax system had enabled Pritzker "to avoid paying his fair share." In a video posted on his campaign website, Kennedy claims the system is designed to give an edge to those who can afford connected lawyers to arrange tax breaks through the assessor's office. "Because they pay less, we pay more," Kennedy complained. Though Kennedy's family has long been associated with East Coast politics, it also has a significant Chicago connection that stretches back to the 1940's when his wealthy investor grandfather, Joseph P. Kennedy Sr., purchased the Merchandise Mart and Wolf Point. Chris Kennedy arrived in Chicago years ago to manage both properties for his family, though the Mart has since been sold off. The Kennedy family connection to Tully reaches back to at least the late 1970s when, as a private attorney, he represented them in assessment disputes involving the Mart. In 1974, Democrat Tully was elected Cook County Assessor, but left in 1978 to return to private practice where he began doing Chicago tax work for the Kennedys. Michael H. Moirano, a lawyer representing Tully, said Tully declined to discuss any matters involving his property tax work, citing privacy concerns for his clients. In a prepared statement, Berrios said all donations to him are irrelevant to the decisions of his office. "For all properties, campaign contributions play no role, none, in assessments and appeals. We assess property, not people," Berrios said. However, the decision to reduce the valuation was forcefully defended by Thomas Jaconetty, a top Berrios aide. Jaconetty cast doubt on the validity of the previous $13.5 million valuation for the Wolf Point property because it was calculated prior to Berrios' taking office in 2010. "We don't know where the $13.5 million comes from," said Jaconetty, the deputy assessor of valuation and appeals. "And so, I wouldn't rely on that number meaning anything." The appeal filed by Tully centered on an argument that the assessor had mistakenly thought a revenue producing three-story parking garage occupied the Wolf Point property. Such a structure had once existed but had long since been demolished and replaced by a surface parking lot. In the appeal, Tully said it was proper to only consider revenue produced by the surface lot in calculating the property's value for tax purposes. Berrios' office agreed, choosing not to factor in the development potential of a property that the Kennedy group had already begun trying to exploit by 2012. "Valuing it as its interim use as a surface parking facility makes all the sense in the world because that's the use to which it was being put and could be put at that point in time," Jaconetty explained, adding that at the time the appeal was approved future development of Wolf Point was uncertain. The success of the appeal led to a big tax cut for the Kennedys which included an immediate, albeit modest, bonus. Instead of having to pay the second installment on the Wolf Point property tax bill for 2012, they got a refund check from the county worth $21,505. Richard Almy, an international expert on assessment procedures, questioned why Berrios' office did not require the owners of Wolf Point to seek an independent appraisal of the property's value before acceding to their appeal. "One would think that if you're going from $23 million to $6 million valuation there should be some back up for it other than an income statement from the parking lot," said Almy, former executive director of the International Association of Assessing Officers. If there had been such an appraisal, Almy continued, it would be common practice to value property by a standard known as highest and best use. "I doubt whether you could find an appraiser in 2012 to opine that the highest and best use was a parking lot," said Almy. In 2012, values of other properties near Wolf Point were rising. Owners of the Kingsbury Plaza development a few blocks north said their land was worth $150 per square foot in an appraisal submitted to Berrios. After the Kennedy appeal, the assessor pegged the value of Wolf Point at $35 per square foot. Two years later, after having received final zoning approvals, the Kennedys negotiated a sale of a portion of their investment for $20.3 million while still retaining a significant share of the overall development, according to real estate transfer documents and Kennedy. The assessor's office then raised its valuation of the soon to be developed land to $21.9 million for 2014 - more than three times the value it established in response to the Tully appeal two years before. Chris Kennedy said the lower valuation was appropriate for Wolf Point in 2012 because City Hall was still mulling approval of its development and it was not yet clear the project could get off the ground. Tully's donations to Berrios, though large, are not unusual. Tully is part of a cottage industry of property tax lawyers who help clients navigate the complicated county tax system, and over the years many of those attorneys have made frequent contributions to the political coffers of Berrios and other elected assessment officials. State records show that Tully, since January 2012, has donated $135,700 to political committees backing Berrios as assessor, another in his separate capacity as 31st ward Democratic committeeman and another for his ward organization. Some of the Tully money also went to the Cook County Democratic Party which Berrios controls as chairman as well as a campaign fund for Berrios' daughter, Toni, a former Democratic state representative. In mid-June, Tully gave $6,000 to political funds controlled by Berrios. Those donations followed by just days the publication of an investigative report in the Chicago Tribune alleging a pattern of unfair residential assessments that often advantaged wealthier property owners who could afford attorneys to shepherd their appeals. Chris Kennedy said he was "totally unaware" of Tully's donations, some of which were made through a political committee still controlled by Tully even though he has not held public office since 1978. Kennedy earlier proposed a ban on campaign contributions from property tax lawyers. Prompted by BGA questions about Tully, Kennedy said he now thought the proposed ban should be expanded to other, more indirect, forms of giving. "People shouldn't be able to use a campaign committee to make donations if they're also in the property tax appeals business," Kennedy said. "I like that idea. It hadn't occurred to me frankly. But it's a great point." Chuck Neubauer and Sandy Bergo write for the Better Government Association, a Chicago-based watchdog group. Property Taxes Jump and Jaws Drop! The property tax bill on Jeff and Roberta Price's Lincoln Park home was about $400 in 1977, the first year they lived there. It's been going up ever since, but rarely with the jolt of this year's 63 percent increase. The increase, from $8,652 to $14,104, has the couple reconsidering their plan to retire in the Kenmore Avenue home where they raised their kids. They're looking at homes in Indiana "as a backup plan" for the time when Roberta retires in a few years, said Jeff Price, who is already retired. "We have lived in our home for almost 39 years with the hope that we could remain here in our golden years," Jeff Price said. The increase in their tax bill amounts to about $454 a month, an amount they can squeak out, he said, but he's aware that for homeowners who struggle financially, it won't be easy. "I don't know how anyone can plan their life with these unconscionable increases," Price said. The Prices are among about 1.4 million residential property owners in Cook County facing an Aug. 1 deadline to pay the second installment of their 2015 property taxes. The tax bills, mailed out by the Cook County Treasurer's Office in June, are the first to reflect both the higher assessments of city properties' value that were released last fall and the city upping the pension part of its tax levy by $318 million. Chicago homeowners' bills went up an average of 12.8 percent, Cook County Clerk David Orr said in June. Average increases were smaller in suburban parts of Cook County because they were not reassessed last year. North suburban homeowners' tax bills averaged an increase of 1.7 percent, and in southern suburbs, it was 2.1 percent. In the city, "jaws are dropping when people see their new bills," said Mabel Guzman, an @properties agent. Guzman said that shortly after the bills hit their mailboxes, two of her past clients whose bills jumped more than 30 percent called to look into selling their properties, in Edgewater and Hyde Park. Neither has sold yet, but one, the investor-owner of a Hyde Park townhouse, "isn't sure how to make the property work for him when you're billing him this outrageous amount for property taxes." The bill for Benjy and Ella Lipsman's Humboldt Park townhouse shot up 77 percent, to $7,227. When they bought the house in October 2014, they thought the taxes were low compared to other properties they considered buying and expected them to go up given their home's proximity to the popular 606 trail, Benjy Lipsman said. But they were still taken aback by the hike, which works out to about $263 a month. "It's not like our incomes have gone up while the mortgage payment stayed the same for a lot of years," he said. "This is a couple hundred extra dollars when we feel like we just bought the house recently." Had they known how much the taxes would go up, they might have considered buying a slightly lower-priced house to leave room in their budget for the increase. As it is, "we've got no choice," he said. "We bought it." Alfrede Delle saw it coming, too–or thought she did. When she bought a condo on Cleaver Street in Wicker Park in June 2015, the contract included an agreement that the seller would pay 110 percent of the past year's property taxes, an arrangement that typically insulates the buyer against annual increases. But 110 percent was far too small, as many buyers and sellers have learned in the past year. Her bill came in almost 40 percent higher, at $7,745. "It was a shock to the system," Delle said. The increase means Delle will need to pay about $182 more into her escrow account in her mortgage payment. (The majority of Chicago-area homeowners make monthly payments toward their property taxes in their mortgage payments. The lender keeps the money in an escrow account and pays it out when billed by the county.) She's looking into refinancing her mortgage at the low current interest rates, hoping to cover some of the increase by bringing down her house payment. While Delle said she "might not" have bought a home if she'd known how much taxes would rise, she's staying put. That's what most people will do, said Fran Fyrman, an @properties agent and River North resident. At least they can deduct the extra expense from their federal and state income taxes. "That's the way it is if you want to live in Chicago," Fryman said. "Taxes are going to go up, so enjoy your home and the write-off you get." The office that mails the tax bills has been corrected. Click on the images to view the video! Who Exactly is Affected by Chicago's Record Property Tax Hike? Yesterday, the Chicago City Council voted in favor of a budget that will include a historic property tax hike of $589 million to fund the city's police and fire department pensions. And while we were warned about the looming property tax hike weeks ago, it seemed like there was a chance that the plan would face some stiff resistance. Instead, the budget passed in the city council yesterday in a 36-14 vote. But who will this record property tax increase really affect? In a geographic sense, the increase will spare much of the city's south and west sides. In fact, many homeowners throughout the south and west sides may actually have a lower property tax bill. However, some aldermen and activists have warned that the historic tax hike will hit renters the hardest. Rents throughout downtown and the North Side have been steadily increasing, with rents for a new studio in a luxury tower breaking the $2,000/month mark. The home buying and rental markets in neighborhoods like the West Loop, South Loop, Wicker Park, Logan Square, Humboldt Parkand even Avondale have been hotter than others, and the renters in these neighborhoods are the ones who should be most concerned about a possible increase in their rents. There have already been some neighborhood skirmishes in Logan Square, Humboldt Park and notably in Pilsen regarding runaway gentrification, and some activists say that the property tax increasewill only exacerbate the effects. So, would the property tax hike prevent potential homebuyers from buying in Chicago, or would it cause current homeowners to leave the city? In a poll taken in September, Curbed readers were largely split. Many said that property owners were already paying enough, while the majority said that they could stomach the budget plan and the tax increase that will come with it. A smaller number said that they were still unsure but were concerned. The new property tax increase will be rolled out over four years, with the biggest increase hitting homeowners next year. For 2015, the city will seek $318 million, then $109 million in 2016, $53 million in 2017 and finally, $63 million in 2018. Joel Schurtz lived all across the U.S. before coming to Illinois. He took promising job opportunities where he could find them, from California to Alabama. His wife, Michelle, and their three young children would follow. The Schurtzes paid their first full year of property taxes in 2015. The bill totaled $11,000. When it comes to property taxes, sticker shock is typical in Illinois. From small-business owners in Chicago to suburban dwellers in middle-of-the-pack school districts, long-time Illinoisans are often bewildered as to why they pay the second-highest property taxes in the nation, at an average of more than 2 percent of a home’s value. And the nonpartisan Tax Foundation said Chicago’s record-setting property-tax hike will likely vault Illinois to the top of the table, making the Land of Lincoln home to the highest property taxes in the U.S. But an average only tells so much of the story. Property taxes become a second mortgage that homeowners can never pay off, or an endless expense for a small business that grows more costly each year. The Schurtz family’s first year of property taxes came out to 4 percent of the value of their Geneva, Illinois, home. For many Illinoisans, the burden is even heavier. Job Varghese, an Indian-American immigrant who left his job with the federal government to strike out as a hospitality entrepreneur, pays $220,000 per year in property taxes on his southern Cook County hotel – more than he pays on the mortgage. And it gets worse each year. Over the last 10 years, Varghese’s annual property-tax bill has risen by $70,000. “If I moved my hotel three miles away from here [to Indiana], that $70,000 would be my entire property tax [for one year],” Varghese said. Illinois Policy Institute research shows nearly every Illinois county has seen dramatic increases in its residents’ average property-tax burden since 1999. Residential property taxes now eat up an average of 6.4 percent of a typical household income in Illinois. In 1990, that share was 3.6 percent. In this shift lies the pain currently felt by Illinoisans whose family budgets have been thrown into disarray. Cassandra and her family are not alone. In McHenry County, where the Bajaks reside, property taxes take up nearly 8 percent of the median household income. The average monthly property-tax bill stands at $499, and the typical property-tax burden in the county has ballooned by over 45 percent since 2000. Suburban father Peter Brunk has felt the squeeze in Lake Villa, Illinois, which is located in Lake County. Brunk, too, has made plans for an Illinois exit in the near future. Since his family moved into their home in 2010, the annual property-tax bill has risen by more than $2,300, or nearly 30 percent. Meanwhile, the value of his home actually decreased. The home’s assessed value, which is used to calculate property taxes, has dropped by 11 percent. The typical Lake County household’s property-tax burden has risen by 44 percent since 1999, with the average property-tax bill now coming in at more than $600 per month – the most expensive of any Illinois county. Brunk’s most likely destination after his daughter graduates from high school? Florida. He said the difference in property taxes alone will more than pay for the move and a nicer home. A closer look at government data reveals the cause behind the meteoric rise of Illinois property taxes, which forces people like Brunk out to greener pastures in other states. These four horsemen of fiscal doom are all multiplied by the sheer number of taxing bodies in Illinois – at nearly 7,000 – each with its own staffing and programming costs. No U.S. state comes close to Illinois on this number. In Wauconda, Illinois, Mayor Frank Bart sees the squeeze on middle-class residents brought by these rising costs. After accounting for inflation, Wauconda’s median household income hasdropped since 2009, according to U.S. Census Bureau estimates. But property-tax bills have continued to rise. Take government-worker pension benefits, for example, which are mandated at the state level,regardless of whether local governments can afford them. Bart expects police pensions to cost the village over $1 million annually within the next two years. The village has 25 police employees and a general fund budget of just over $9 million. Bart uses his second-lowest paid police officer to illustrate the high personnel costs village taxpayers shoulder. The officer has been with the village for more than 10 years, and the village pays his $85,000 salary and $15,000 in benefits annually. On top of that, taxpayers contribute $25,000 to his pension each year, Bart said. Prevailing-wage laws levy another massive blow to local governments’ bottom lines. These laws can mandate six-figure salaries plus benefits for the lucky private-sector employees who work on government projects. Bart estimates this easily adds 20 percent to project costs above what would be offered in a competitive bidding process. Finally, while Bart said effective departmental leadership has prevented workers’ compensation costs from getting out of hand in his community, this is not always the case. Take Williamson County, for example, which has spent $2.7 million on workers’ compensation claims over the last three fiscal years, nearly four times as much as the previous three-year period. A major effort to stop Illinois’ sky-high property tax rates from creeping even higher lies in House Bill 4224, which would freeze property taxes at current levels unless local voters approve a future property-tax increase. This legislation is part of Gov. Bruce Rauner’s Turnaround Agenda. But a freeze alone won’t be enough. Property taxes would have to stay frozen for the next 28 yearsfor Illinois residents’ property-tax burden to return to levels seen in 1990. So it is important that HB 4224 also gives local governments more flexibility in controlling costs, such as allowing cash-strapped localities to narrow the scope of collective-bargaining agreements and to take less expensive bids for government work. Another key component to easing residents’ property-tax burden will be aggressive consolidation and resource-sharing across Illinois’ thousands of local taxing bodies. DuPage County has taken the lead in this area. Other counties should follow suit. As average property-tax bills begin to bump up against average mortgage payments, communities will increasingly be ripped apart as people and businesses flee to areas where they need not pay twice for their property: once to the bank and once to the government. Unfortunately, this is already happening. Many of Chicago’s south suburbs may have already crossed this line in the sand, and face a long, painful road to recovery. Numbers at the state level are equally concerning. Illinois has lost a greater share of its population to out-migration than any Midwestern state since 2010. Susann D., a retired widow and longtime resident of Mt. Prospect, Illinois, best describes the angst among Illinois’ middle-class residents who can no longer shoulder the tax burden placed upon them by a broken system. “I do want to leave. But this is the most difficult question in my life,” she said. Susann’s poignant questions should be met with loud cries for reform from Springfield and across the state. Cook County Property Taxes to Hit This Week! Cook County homeowners can expect the first installment of their property tax bills to show up in mailboxes this week. Property owners will have until March 4 to pay the bills, which will be equal to 55 percent of the total tax tab paid last year on each piece of land. The second installment, which is scheduled to go out in late June, will show any changes to the bills caused by increased taxes or changes in the value of a property for tax purposes. For the second year in a row, the bills put together by Treasurer Maria Pappas will include the debt owed by each individual unit of local government. Pappas is trying to highlight the issue of rising local debt, including those for underfunded pension systems. (Reuters) - When Tom Hunter and his two roommates were left without heat for more than a month by a negligent landlord in New York, they began toying with an idea: an app that could help renters keep landlords in check. (CBS) – Ghost voters are legendary in Chicago politics. Property owners over 65 must apply every year for a senior exemption and cannot qualify for a senior freeze if their household income is over $55,000. They have to sign the forms “and be on record that you’re still alive,” the assessor says. Armed with a new law he proposed to the legislature, Berrios can go back four years to collect undeserved tax breaks plus interest and penalties. That is what happened to Margaret Kloniecka, the owner of a home in the 1500 block of North Wood St. in Wicker Park. She got $34,597 in tax breaks over the last four years. With interest and penalties, she recently paid back $61,003. Kloniecka inherited the property from her cousin, who died in 2001. She says any underpayments were due to a “mistake” by a lawyer. Combined with purging the property tax rolls of improper homeowner exemptions, Berrios predicts the total savings for the past year will be $12 million to $14 million. Cook County, Ill., has discovered approximately $9.4 million in new revenue thanks to a new state law and an analytics-based fraud detection solution. Illinois lawmakers passed SB 41 last year, enabling counties to pursue individuals who took erroneous and fraudulent property tax exemptions. Previously the maximum penalty for those getting caught taking illegal exemptions was $40. Now counties that opt-in to the law can go after the full amount of tax owed. Once SB 41 went into effect, Cook County partnered with LexisNexis Risk Solutions to streamline the review of property tax records. The company’s Homestead Exemption Fraud Detection Solution takes the county’s property tax database, analyzes it using analytics and public records, and delivers a report to the Cook County Assessor’s office that flags individuals who may be erroneously claiming exemptions. County staff research those individuals, and if they appear to have filed fraudulent claims, issue a bill for the proper amount of property tax owed. The new billing process started in March, and since then, Cook County has recovered $5.1 million. An additional $4.3 million is still outstanding, with most of the individuals who owe going through the county’s hearing process on the issue, according to Cook County Assessor Joseph Berrios. If taxpayers don’t pay what they owe within 30 days, the county places a lien on their home for the owed amount. In an interview with Government Technology, Berrios said SB 41 enables his office to go back three years in the records to bill for property taxes owed if an individual is found to have filed one or two fraudulent homestead exemptions. If more than two erroneous exemptions were claimed, the county is permitted to bill up to six years in arrears. Homestead exemption laws protect the value of a person’s home against creditors and property taxes in certain situations by exempting a certain amount of a home’s assessed value, requiring the owner to pay less in taxes. The law varies depending on the state, but in general, it applies only to a person’s primary residence, not multiple properties — and that’s where fraud becomes an issue. Berrios admitted that he was surprised at the number of fraudulent exemptions taken by people in Cook County. But he doesn’t believe the problem is over just because the county now has a system in place to catch people and recoup the money. Tightening up property tax fraud laws and cracking down on violators is a growing trend in state and local governments. Two years ago, Delaware County, Ind., deployed a similar system that uncovered $1.5 million in lost revenue. In addition, Florida tweaked state law to enable assessors to go back as far as 10 years to evaluate whether homestead exemptions were abused by property owners, according to Berrios. LexisNexis isn’t the only player in the fraud detection technology game. In 2012, Thomson Reuters’ Government Revenue Management Insight tool helped Miami-Dade County, Fla., discover more than $5 million in back taxes owed by county residents. Looking ahead to 2015, Berrios said he wants to go back to the Illinois Legislature to increase county jurisdictional authority under SB 41. The assessor explained that if his office notifies a taxpayer of an erroneous exemption that is at the tail end of the three- or six-year timeline cutoff, there can be a problem collecting if a taxpayer’s hearing and appeal process goes into the next calendar year. So Berrios wants to add language that reserves the county’s ability to collect what fraudsters owe, even if it is from a calendar year outside the current scope of the law. Brian Heaton is a senior writer for Government Technology. He primarily covers technology legislation and IT policy issues. Brian started his journalism career in 1998, covering sports and fitness for two trade publications based in Long Island, N.Y. He's also a member of the Professional Bowlers Association, and competes in regional tournaments throughout Northern California and Nevada.